One of my favourite competitions of the sporting calendar took place last Friday when we joined Cumnor House and Windlesham for a Pentathlon. For those not in the know this is an event where each athlete must compete in the hurdles, 100m, long jump, shot put and finish with a gruelling 800m. They score points in each event which are then accumulated to give an individual winner and also caters for an overall winning team. This competition is a great way to blow away the cobwebs which were left over from last summer, try and get PB’s in your strong events and also offers the chance to try something different which may be outside of your normal skill set. I selected a rather young squad this year with Gabi, Luke, Sam (all Year 5) and Jemima (Year 7) all competing a year up from their regular school age groups. Daniel, Beau, Rosie (all Year 8) and Beth (Year 6) made up the rest of the team. 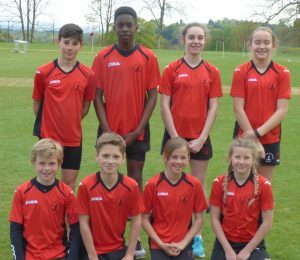 In the Year 6 competition our highlights were Gabi who won the Girls’ 800m, Luke who came 3rd in the 100m, Sam’s 2nd place finish in the Boys’ 800m and Beth who finished 2nd and 3rd in the Shot Put and Hurdles respectively. I was very pleased with the Year 6 team, especially as 3 out of the 4 were competing out of age group so this bodes well for the rest of season. 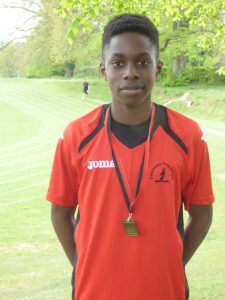 The Year 8 team produced some fantastic performances most notably Daniel who won each of the 5 events at a canter. Beau was in fine support coming 2nd in the 800m and 3rd in the 100m. Jemima saved her best performance for the Shot Put were she secured 2nd place and also came 2nd in the Hurdles. Rosie was solid throughout finishing 2nd in the Long Jump and 3rd in the 100m, 800m and Shot Put. We didn’t quite make the grade in the team event when all points were added together but we are proud to announce that Daniel took home the gold medal in the Year 8 Boys’ competition with Rosie earning the bronze medal position in the Year 8 Girls’ event. I have been looking forward to the athletics season since before Christmas and if the pentathlon is anything to go by I think we are in for another successful summer. Please keep an eye out for the meets at Lewes, Burgess Hill, Hurst and K2. Well done to the 8 children who took part on Friday; please don’t forget to collect your double effort stars from me!